You Will Receive: 1 Motorola RDU4160D Two Way Radio Walkie Talkie. We will contact you to see if you need your new radio(s) to be programmed to work with any existing radios. 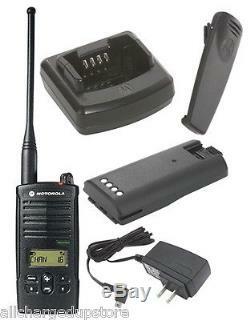 The Motorola RDU4160D is a 4-watt, 16-channel two way radio walkie talkie with a display screen. The display screen allows you to constantly know how much battery life remains and what channel you are communicating on. This two way radio offers up to 18.5 hours of battery life, allowing you to enhance communication and safety in your workplace. Along with outstanding battery life, the RDU4160D is incredibly durable and has great speaker quality. This two way radio is great for everybody, but is particularly useful for construction sites, manufacturing plants, and other industrial environments that require long and rugged use. One UHF Professional Two Way Radio model RDU4160D. 2400 mAh Lithium Ion Battery Pack (up to 18.5 hrs of life per charge). Charging Adapter and Stand Up Drop-In Charging Tray for RDU4160D. Range Varies based on Terrain and Conditions. The Motorola RDU4160d is a 4 Watt 16 Channel UHF two way radio with display. The Motorola RDU4160d operates on 89 UHF Business Exclusive Frequencies and offers 122 Privacy Codes to ensure private two way radio communication. The RDU4160d can be custom programmed to work on any Commercial Frequency and is a Repeater Compatible two way radio. The Motorola RDU4160d provides coverage of up to 350,000 sq. You can expect to communicate up to 2 - 4 miles depending on your surroundings. Durable metal die cast chassis helps radios hold up under demanding conditions. The Motorola RDX Series model RDU4160d meets Military 810 C, D, E, F and IP54/55 specifications for shock, rain, humidity, salt, fog, vibration, sand, dust, temperature shock, and high and low temperatures. This essentially means the RDU4160d radios (walkie talkies) will take a beating. While the RDU4160d aren't indestructible, they are designed to withstand a 5 foot drop on concrete, driving rains, and the dirtiest of environments. The RDX Series model RDU4160d audio is 30% louder than previous Motorola XTN and AX models thanks to 2000mW audio output, speaker magnetic field reduction, wind-noise reduction and improved RF specifications. The improved speaker found on the RDU4160d makes communication clear. Flexible and Durable Battery Life Solutions. Th RDU4160d feature the ultra high capacity 2400 mAh LiIon battery (up to 18.5 hrs of life per charge). The RDX Series model RDU4160d professional two way radios come with a. The item "1 Motorola RDU4160D UHF Two Way Radio Walkie Talkie Best Price! Ships Free" is in sale since Monday, February 29, 2016. This item is in the category "Consumer Electronics\Radio Communication\Walkie Talkies, Two-Way Radios". The seller is "allchargedupstore" and is located in Greer, South Carolina. This item can be shipped to United States.